I have been working with my 4 year old on recognizing beginning sounds in words and reading simple cvc (consonant-vowel-consonant) words. 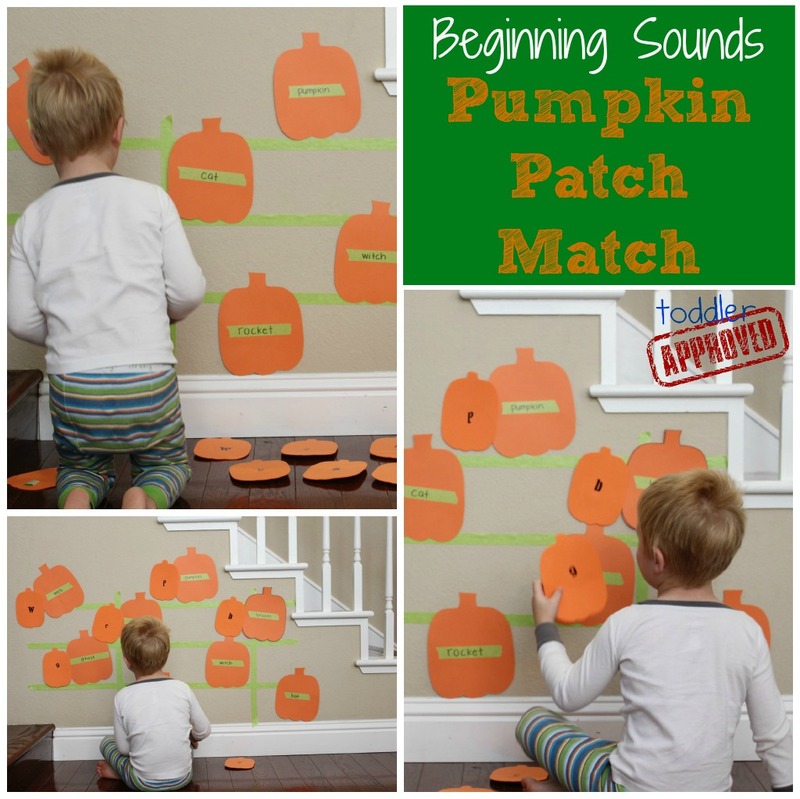 He is really interested in words and reading, so today I decided to combine that interest with his current love for pumpkins and pumpkin patches... and create a simple Beginning Sounds Pumpkin Patch Match activity. Materials Needed: painters tape, small foam pumpkin pieces, alphabet stickers, bigger pumpkin cut outs, marker, and a wall or floor space. 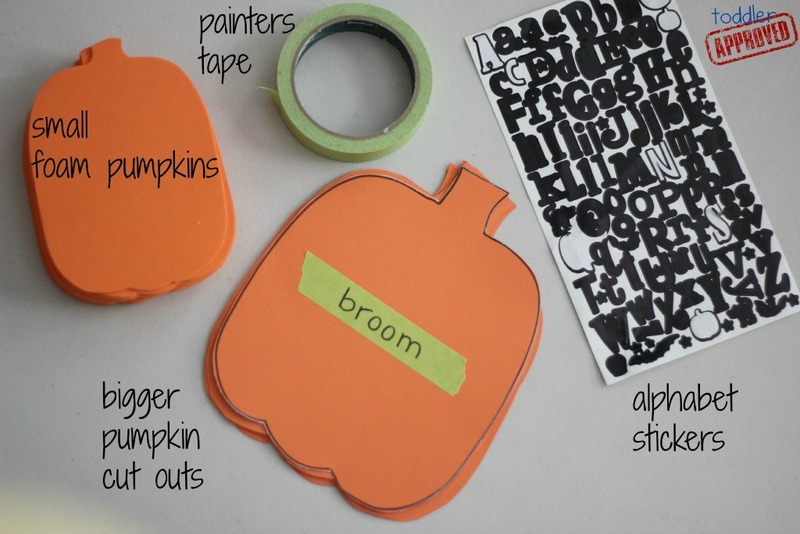 I used painters tape and stickers for this activity so that the letters and words could be easily changed without destroying the pumpkins. I was too lazy to laminate and cut everything out so that I could use a whiteboard marker! If you are less lazy, laminate the big paper pumpkins and write your words with a whiteboard marker. 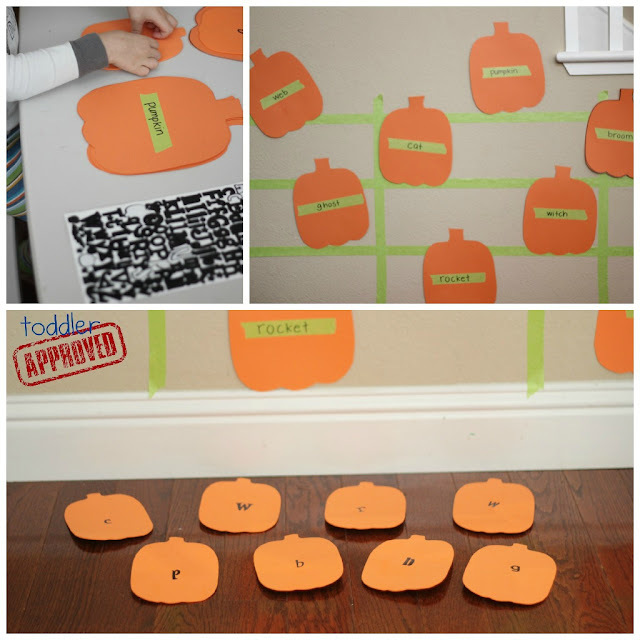 Cut out about 10 pumpkins from orange cardstock and write simple Halloween or cvc words on them using painters tape and a marker. Have your child look at the first word, identify the beginning sound of the word and the letter that makes that sound, and then have your child put a sticker with that letter on it on a baby foam pumpkin (or a small cardstock cut out). Have your child create a corresponding baby pumpkin for each bigger pumpkin. Stick one set of pumpkins on your wall (big or baby) and have your child try and match the other set to correctly pair the beginning sound with the corresponding word that starts with that sound. We stuck the pumpkins on the wall with painters tape. If your child is not ready for words, you could easily do this activity as an upper and lowercase alphabet letters matching activity instead. Once your child has matched the letters once, you can take them off and try again, or work together to come up with new words that start with the beginning sounds. As an elementary school teacher I loved creating interactive spaces in my classroom where my students could constantly be learning in a hands-on way. 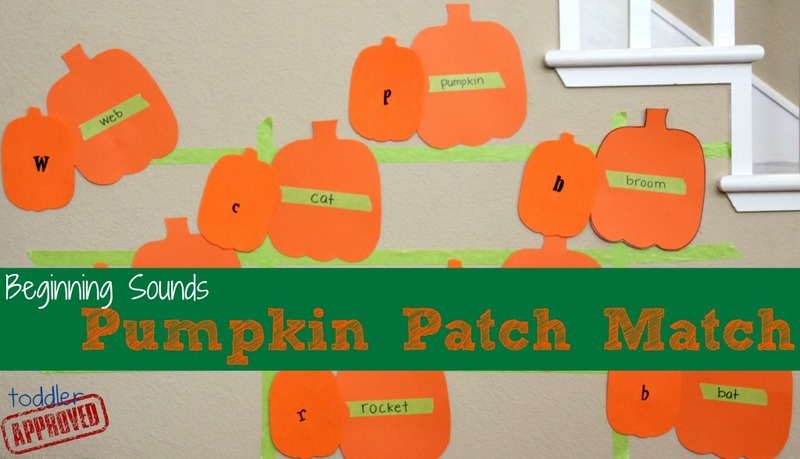 Since my home is also my mini classroom, I plan to keep our pumpkin patch constantly changing over the next few weeks so that we can practice different letters and words using this interactive display. We can use it to match numbers, shapes, and many other things just by drawing, sticking on, and writing new things on our pumpkins. How else would you use this pumpkin patch to teach your child? What else could they match? PS- The green tape lines are supposed to be a green fence... not my finest creation, but I'm all about simple, functional, and easy. The learning goal is more important than the presentation, right? This is really great stuff! I think it's so fun to do this in an unexpected place like a wall! My kids would love this!